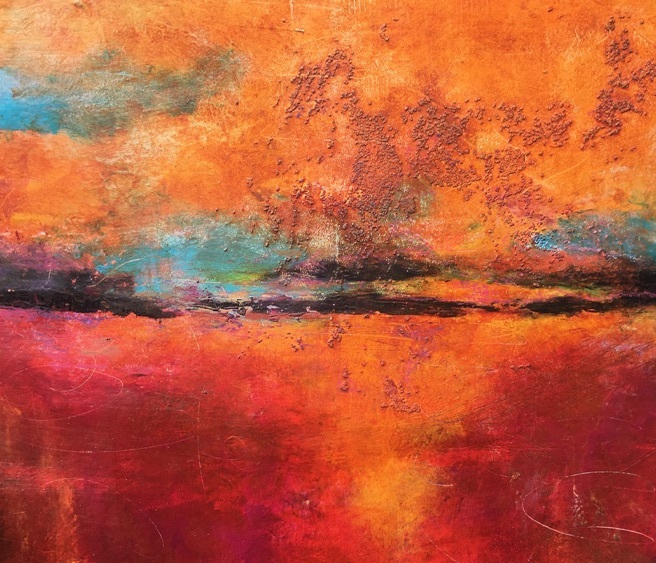 Luminous layers of color and wax combine to make painting in this medium magical. Explore an ancient technique that combines the beauty of oil paint, cold wax and mediums to create rich deep paintings from abstract to landscape to realism. In this workshop you will learn everything you need to know to paint in the medium and complete multiple beautiful paintings. Learn texturing methods by digging, scraping, collage, mono print, stencil, stamp, papers and patterns. Archaeology in paint and wax combines to create deep, beautiful work. Layer opaque and transparent paints and texture to move light in and out of your work, truly magical! Lynne Wintermute has a BFA from Linfield College and graduate studies at Pacific Northwest College of Arts, and Universities in London and Dublin. She shows her work throughout the Northwest in invitational shows and galleries and teaches workshops in Oregon and Washington. Lynne paints acrylic expressionist landscapes as well as abstracts in oil and cold wax. Lynne works out of her studio in Pacific City, Oregon. Lynne has taught at Sitka for several years. Her teaching philosophy is to learn as much as possible while in class, to work in a collaborative atmosphere and, above all, to have fun and enjoy the other artists in the workshop.